Thanks to everyone for tagging along as I shared how we prepared our dog Baxter for the birth of our first baby, Ellie. Ellie is now four months old. I feel like Baxter adjusted very smoothly. He’s not a devoted big brother who has to be near her all the time, but neither is he jealous or irritated or uneasy. Mostly he doesn’t pay very much attention to her. Which is absolutely fine with me. Every so often, he seems a bit protective. When I’m working outside in the gardens and Ellie is in her stroller, Baxter invariably chooses to lie beside the wheels. I said in my first post of this series that growling is good. Baxter has started growling in a new way—he growled at a couple of visitors when they were near Ellie and nowhere near him. I’m trying to do a better job of managing situations so that he doesn’t become uncomfortable when people are around his baby. We’re continuing to make sure Baxter’s and Ellie’s interactions are positive, and we realize as she grows that we’re going to have to teach her how to interact politely with him and that he’s going to have to keep on adjusting to her. To wrap up this series, I wanted to share some of the biggest lessons I learned and also the resources I consulted leading up to and following the birth of our baby. To see all posts in this series, click here. At many points in the preparation phase, I felt very blind. I had no idea how to take care of a baby. Who was I to tell people how to take care of a dog and a baby? However, thinking things through and doing some basic prep made me feel better than if I just crossed my fingers and hoped everything was going to be okay. And now that Ellie and Baxter have been living together for several months, I feel like it has made a difference in how they interact. An important resource was our trainer. She has known Baxter since he joined our family, so she was able to assess him based on a long history. As well, she’s a mom herself, so she drew on that experience in helping us prepare. The most valuable thing our trainer gave me was confidence. She talked about the adaptability of dogs, Baxter’s relaxed attitude in most situations and helped me to feel like some of the issues I was worried about weren’t insurmountable. She also got me thinking in advance about how I wanted to handle key situations like shared spaces or the initial greeting. 1. Work with a qualified trainer. Someone who is experienced working with dogs and children, understands the particular behaviour issues you want to address, has an approach you’re comfortable with, or who already knows your dog will be your most valuable partner as you prepare your dog for a new baby. Throughout my pregnancy I tried to keep my expectations low. I thought Baxter might struggle with certain things—just like I thought I would likely struggle with various elements of parenthood. Therefore, any success feels like a major win! 3. Define what success looks like for you. For me, I summed up success as safe, happy, respect. What safe means for you may be different than what it means to me. Know what you’re working towards and then develop a plan to achieve your goals. 4. Do some prep work. Maybe you’re like me and feel very unprepared for this whole parenthood thing. Training my dog gave me control and confidence in one very important aspect of my life. Plus, while dogs are adaptable, it’s unreasonable to expect them to adjust seamlessly to such a huge change in their life. Implementing a few changes in advance can make life easier for everyone once baby arrives. 5. Listen to your dog. I’ll say it again. Growling is good. It’s a communication from your dog that he is uncomfortable. Watch for other communications from your dog, mostly through his body language, and help him adjust to the baby based on his own comfort level. 6. Your dog is a swimming pool. Maggie from Oh My Dog said to never leave your dog alone with your child. The swimming pool analogy came from one of the books I read (see the resources list below). It’s a good reminder that no matter how confident we are in our dogs or our children they can be unpredictable beings, and the best way to keep everyone safe is to be present and attentive. Baxter is a pretty independent dude who likes his own space. 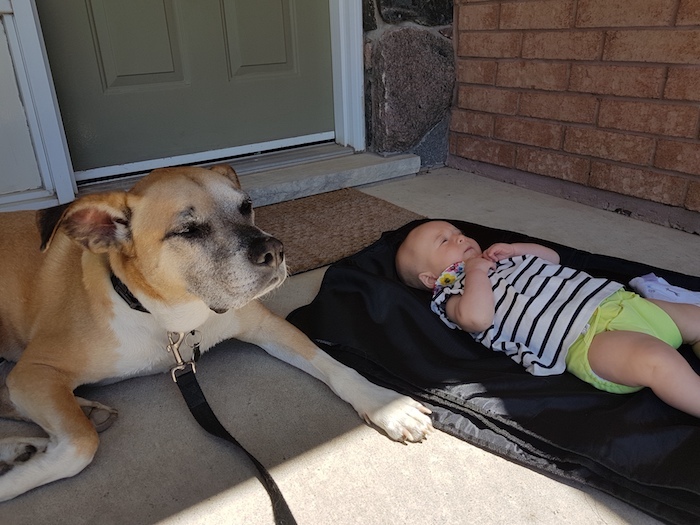 I did not expect him to be the first volunteer for babysitting, and I doubt that he will ever be one of those dogs you see cuddling with the baby. However, he has adjusted very, very well and does seem to view Ellie as part of his family. Aleksandra’s blog was one of my go-tos when we first adopted Baxter (ThatMutt was another). While Aleksandra is no longer posting, her series about preparing her dogs Chick and Doodlebug for their new puppy was still something I referenced as we got ready for our own puppy baby. It’s real, fun and helpful—everything I’m looking for in dog training. In addition to the Q&A post, Kim from Yellow Brick Home also shared two posts on her own blog about their baby prep strategies. In the first, written before their daughter Lucy arrived, she went into more detail about what was most important for their Jack and CC. In the second post, Kim shared very honestly how their dogs adjusted and some of the challenges they faced. A fairly basic book, but covers body language, assessing your dog’s comfort level, training exercises. Deals with infants to children. Includes charts, pictures and drawings to illustrate various techniques or body language, and even an exercise section for children to help them assess dog body language and learn to interact politely with dogs. I like that this book addressed training children as well as dogs. I’m very conscious that teaching Ellie to be polite to Baxter is an important part of helping Bax be comfortable around her. A baby prep manual rooted in the real story of Lisa and her husband adopting their son, Indy. Lisa had three very high needs dogs. Her situation was so extreme it was sometimes hard to identify with what she was going through. Her dogs had serious health issues like seizures, OCD, diabetes and age issues like blindness. She also dealt with behaviour issues like resource guarding and biting. Stories and stats about bites and child injuries drove home the importance of preparing and managing children and dogs. It also made this book a bit depressing and overwhelming. Very reliant on treat training and management through physical separation, which didn’t always resonate with me. Training tips at the end of each chapter broke down the lessons. They are tangible tools you can use with your own dogs. Sharing a house with a baby and a dog is an ongoing project. We will continue to work with both Baxter and Ellie to ensure everyone lives happily and safely together. This will be especially important as Ellie gets more mobile and heads towards toddlerhood—#timeflies. It’s been very special to add Ellie to our family and really rewarding to see Baxter adjust to having her in his life. I hope that this series becomes a resource for other parents and dog owners out there. If you have any questions to ask or advice to share, please leave a comment on one of the posts. Thanks for being part of our family’s journey.